It was my husband's birthday and I was cooking and had just placed his cake on the table. All of a sudden, things started shaking. The doors of our kitchen cabinets started flying open. My hubby grabbed our daughter in his arms and was yelling for me to leave with he and Robyn. I was trying to hold the China cabinets and the television down. They tried to get out of door and ironing board fell out of the closet and in front of door. My husband grabbed the ironing board and threw it out of the way and was still yelling for me to follow them. We finally got down the back stairs where our car was and our daughter did not want to get in the car. She was afraid because the car was rocking back and forth. We and our neighbors drove to the commissary parking lot and stayed there most of the night. In the a.m. we ran back to our homes. The men ran in and grabbed food, water and diapers for the kids. Afterwards we melted a lot of snow. That was one birthday your husband would never forget. 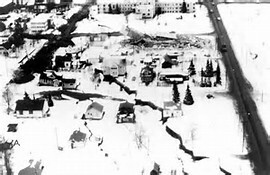 Your memories of the 1964 Great Alaskan earthquake remind us that, like you and your family, many of us recall how our kitchen became a very dangerous place with cupboard doors flying open and canned goods and dishes flying out onto the floor. And, like you, the furniture in our living rooms became moving objects we had to navigate to escape our shaking homes. Another reminder from your story are the parked cars that were being thrown around in drive ways and on streets.